Why do I have a duck despite the fact that she's loud and squirts all over the place? Because of all the amusing things she does! I have a dorky duck I got from my aunt (see A Tribute to Lin's Chicken). Here's a list of strange things she does. Swims around in circles in her pool like a kid in a bathtub. Chases the rabbit and trys to eat her tail. Always has a smile on her face. Likes to sit on your chest and breathe really loud in your face. Disappears at night and doesn't reappear until about 10:00 the next morning. I still don't know where she goes. Trys to run and ends up falling on her face. Sniffs around by my aviary and gets feathers up her nose. 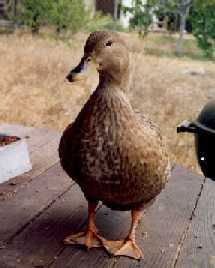 Don't you want a duck now?